Piascore Inc. (Headquarters: Minato-ku, Tokyo, Japan; President: Hiroyuki Koike), a provider of technology-based music services, has formed a partnership with Roland Corp. (Headquarters: Hamamatsu, Shizuoka Prefecture, Japan; President: Jun-ichi Miki), aimed at enabling all the digital pianos launched by Roland in fall of 2015 to provide support for Piascore pedal page turner, plus other products. This integration is primarily aimed at the models LX-17, LX-7, HP605, HP603 and F-140R. Piascore develops Piascore, a smart digital music score app with a Bluetooth® hands-free page turner. 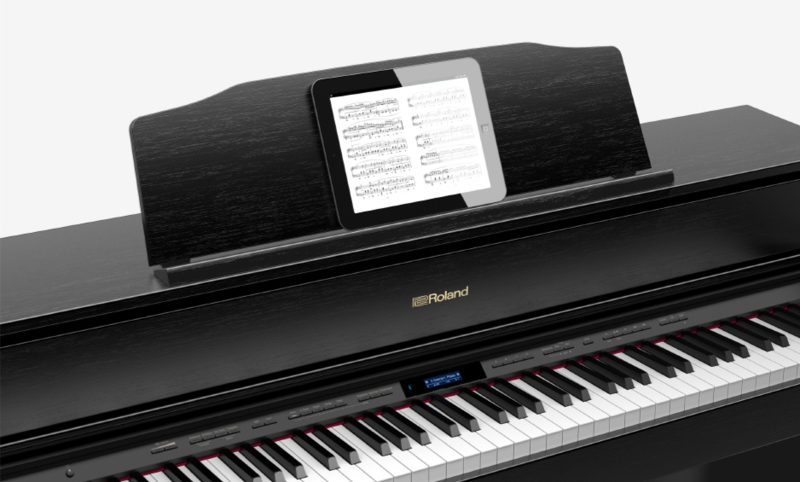 Roland’s development of the world’s first digital piano with MIDI compatible Bluetooth functionality has led to this integration with Piascore. This partnership aims to eliminate the common difficulties experienced by users with page turning while playing music. It allows them to use the piano’s foot pedal to turn the pages of a music score, therefore giving them the freedom to concentrate on their performance even more. In addition, Piascore provides Bluetooth audio functions for YouTube playback, allowing users to play music from the piano’s built-in speakers, and therefore giving them the ability to enjoy playing performances with accompaniment from music on YouTube. Piascore’s philosophy is based on the concept of “Using music and technology to make the world into a much richer and more creative place.” The company specializes in advancing the use of technology in the music business. In the future, they will be working on further development of other essential functions for practicing music, such as cloud-based storage of music scores and management functions for past practice sessions. They will also be seeking to further work in collaboration with music score publishers and institutions of musical education in order to propose new forms of communication for music. Piascore aims to provide a way to easily view music scores, share different methods of music performance, and manage daily practices. It was released in December 2010, reaching the number one position in the iTunes Store’s category download rankings (iPad / Music / Free category), and achieving a total of over one million downloads in 2014. The iPhone/iPad app Piascore (free) is an application that allows users to view digital music scores and write notes as they go through their lessons and practice sessions. The app comes with over 70,000 scores of classical music for free download, a camera function that reads in music scores, plus some essential tools required for practice such as recorders and tuners. In addition, it also provides functions designed to fulfill the needs of performers, such as management of large numbers of music scores using set lists and tags, realistic display-mode for displaying digital music scores as if they were printed on paper, proprietary page rendering technology with world top class speeds, note-making functions, a metronome, and more. Piascore was awarded the title of Distinguished Honoree at the 2011 International Business Awards for the Consumer Entertainment / Information category, was crowned as the winner of the 2012 4th SF NewTech Japan Night, and was also chosen as a finalist at the IVS 2012 Spring Launch Pad. *iPhone is a trademark of Apple Inc. iPod and iTunes Store are registered trademarks of Apple Inc..
Piascore Inc. is an IT venture company established in May 2010 based on the philosophy of “Using music and technology to make the world into a much richer and more creative place.” It specializes primarily in the development and operation of the smart digital music score app Piascore (http://piascore.com/). Company President Hiroyuki Koike previously worked as a software engineer for Sony Corporation, and was selected in 2010 as a Super Creator of the IPA Exploratory IT Human Resources Project.